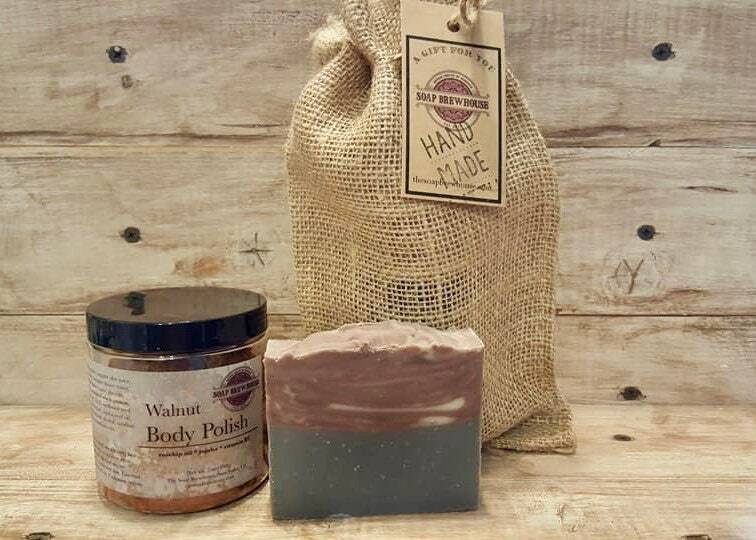 Awesome Beer Soap/Walnut Scrub Gift Set in a Burlap Sac! 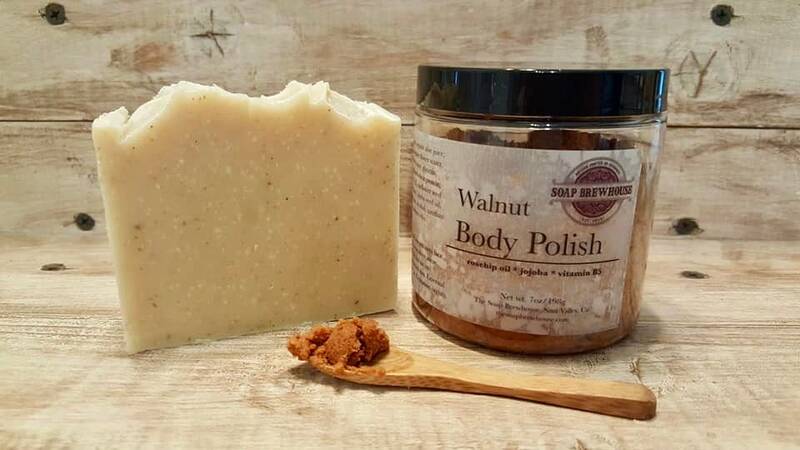 Pick your scented beer soap & I will make to order your walnut body polish in the same scent as the soap (if you want unscented in the scrub, let me know). Ricebran oil &/or olive oil, coconut oil, water, palm oil, beer, grapeseed oil, rapeseed oil, fragrance, micas. May contain activated charcoal, hops, seeds, and sea salt (depending on the soap chosen). If you have a question on a certain soap, message me. 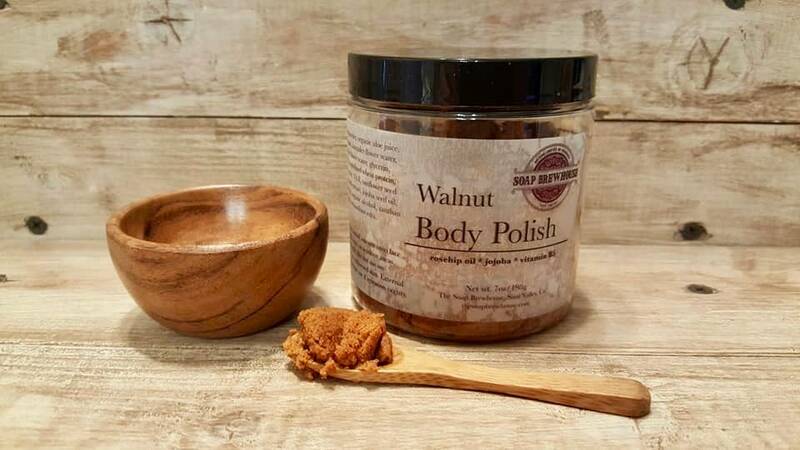 Walnut Body Polish. 7oz/198g Jar. 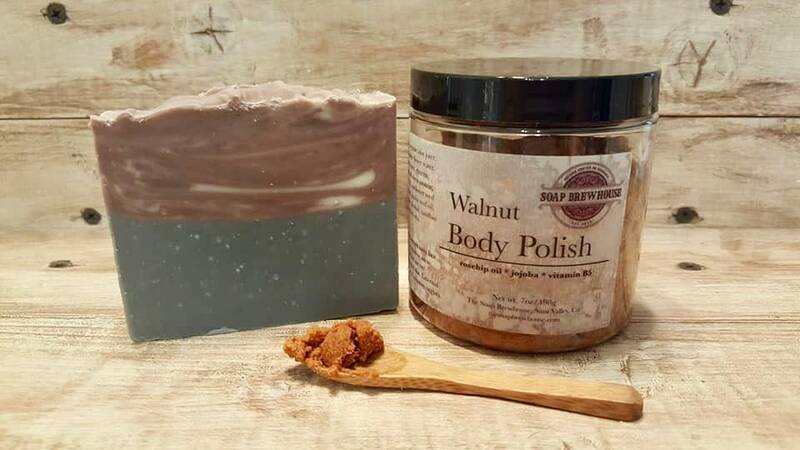 This is our new fine ground walnut polish. NO HARSH SCRUB BITS! 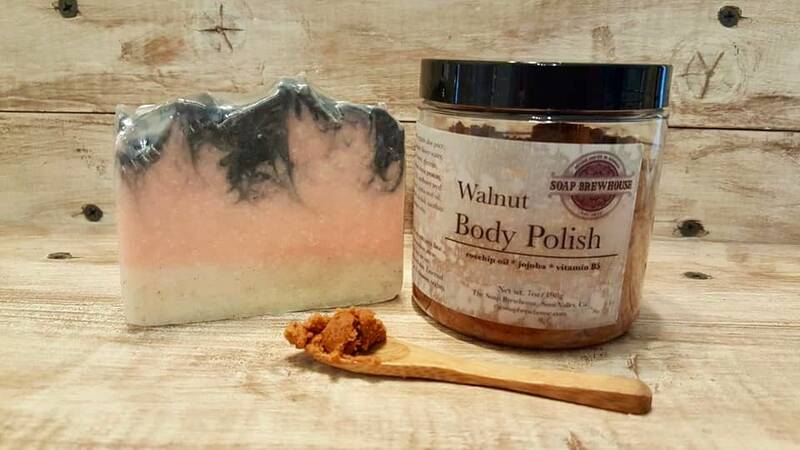 THIS IS NOT THE WALNUT OR APRICOT SCRUBS OF THE PAST. DECYL GLUCOSIDE (what the heck is that? 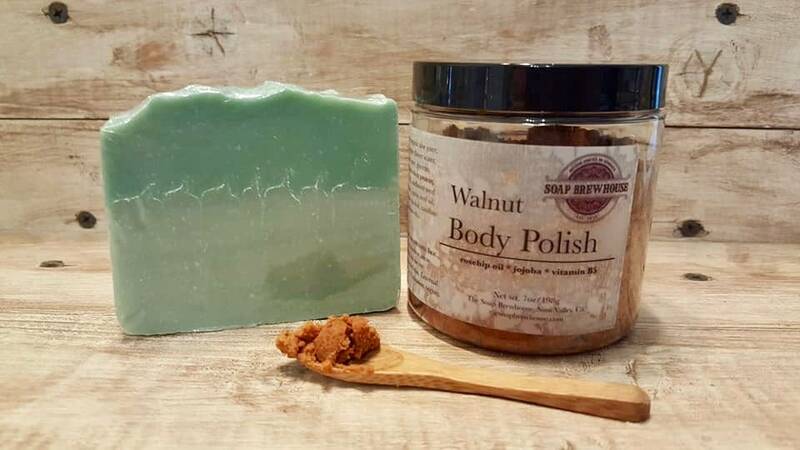 A plant-based fatty acid used to produce lather) So that means the Walnut Polish smoothes and cleanses! 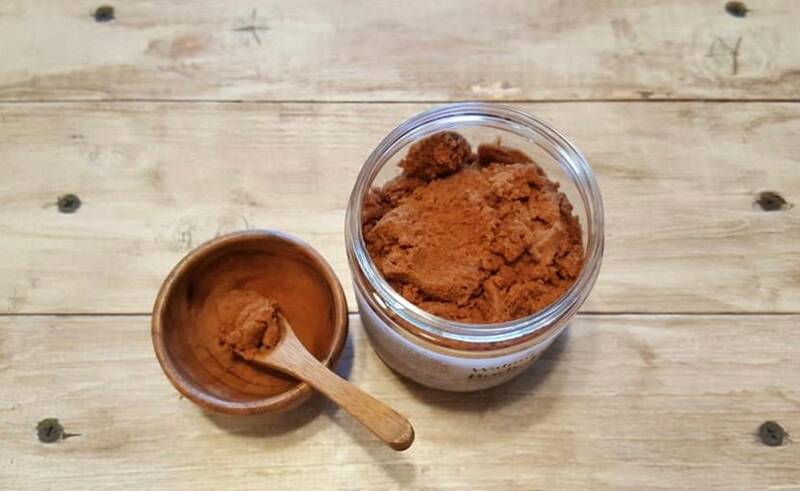 Great for smoothing those rough spots and can be used in small amounts, gently on the face, avoiding the eye area. Walnut Shell Powder, Organic Aloe Leaf Juice, Decyl Glucoside (plant-based cleanser) Lauryl Glucoside, Cocamidopropyl Betaine, Organic Lavender Flower Water, Roman Chamomile Flower Water, Glycerin, Provitamin B5, Hydrolyzed Wheat Protein, Organic Oat straw Extract, Vitamin E, Sunflower Seed Oil, Organic White Willow Bark Extract, Organic Jojoba Seed Oil, Rose hip Seed Oil, Organic Alcohol, Xanthan Gum, Tetrasodium EDTA. How to Use: Gently massage a small amount onto skin avoiding eyes & sensitive areas. Thoroughly rinse with water and followup with your favorite moisturizer.